EVENING SATELLITE : A mainly clear sky is overhead tonight across the Findlay and Hancock County area. Quiet weather will be in the forecast through the remainder of tonight. Temperatures are currently falling through the 60’s. By sunrise Thursday, low temperatures are forecast to drop back into the lower 50s. The more rural areas in Hancock County could easily see low temperatures in the upper 40s. DELIGHTFUL THURSDAY : Very nice weather is one more time in the forecast for Thursday. Temperatures will be climbing steadily after Sunrise. The wind is forecast to remain light and variable. High temperatures are forecast to top out in the lower to middle 80s. Mainly clear skies will remain in the forecast for Thursday Night. Low temperatures are forecast to drop back into the lower 50s, with some rural areas seeing upper 40s for lows. FRIDAY AND THE WEEKEND : Friday will feature chances for afternoon and evening showers and thunderstorms as a low pressure area begins to affect the area. If you are headed out for high school football games across Findlay and Hancock County, make sure to have the rain gear with you. The shower and thunderstorm chances will continue into the night, and through Saturday. The cold front that looks to be responsible for the inclement weather is forecast to pass through the Findlay and Hancock County Area later in the day on Saturday. Drier weather is forecast to move into the region Sunday. High temperatures Friday and Saturday are forecast to range from the middle 80s to the middle and upper 70s, respectively. Sunday will feature high temperatures dropping back into the upper 60s. NEXT WEEK : The weather for the first portion of next week is forecast to be mainly dry. However, amounts of sunshine will be at a premium. As a result, temperatures look to remain below average. 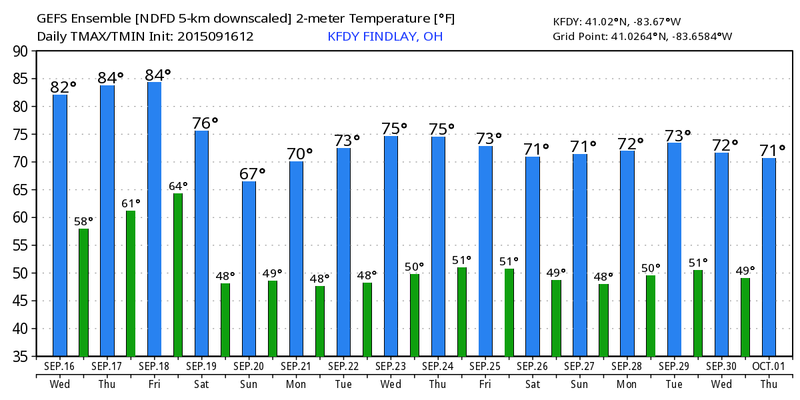 Those temperatures will range from the upper 60s to the lower 70s Monday through Wednesday of next week. LONG RANGE : The longer range continues to indicate the brief warm up for the next few days. 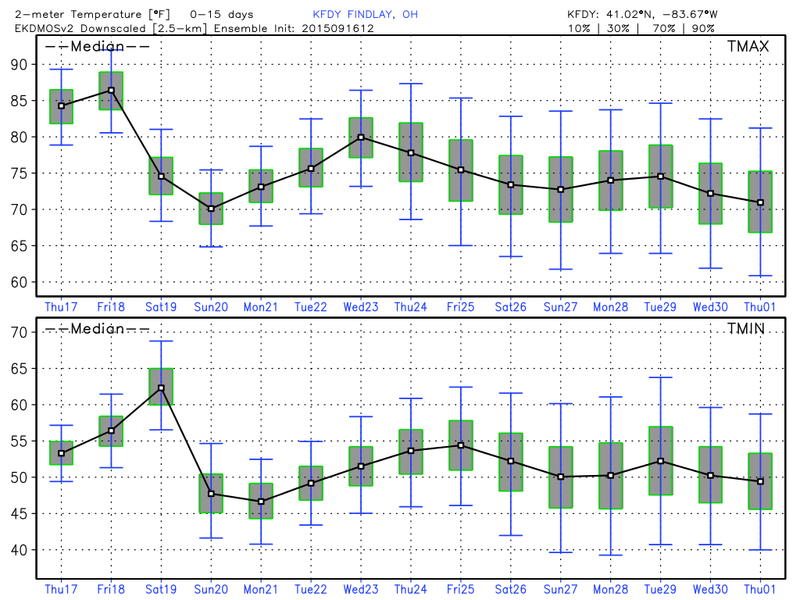 By next week, the ensembles do indicate the cool down as well. Look for the next Findlay and Hancock County Forecast Discussion tomorrow afternoon or evening. Enjoy the rest of your evening!